An awesome 13 year old wanted a Wes Anderson theme for her Bat Mitzvah. We immediately fell in love with the project. We used several of his films as design inspiration for the overall event, but the invitation took a definite Grand Budapest Hotel direction. The save the date was reminiscent of a letter from Madame D. Our graphic designer, Emily Young, created a letterhead with a note in a handwritten font signed by Ruby D. for Ruby Dachis. We used papers in the red, pale pink and metallic pink that we would carry through to the formal invitation. The iconic Mendl’s pastry box from Grand Budapest Hotel was our springboard for the formal invitation design. We printed an address label and envelope liner in a print that looked like a weathered, damask wallpaper. 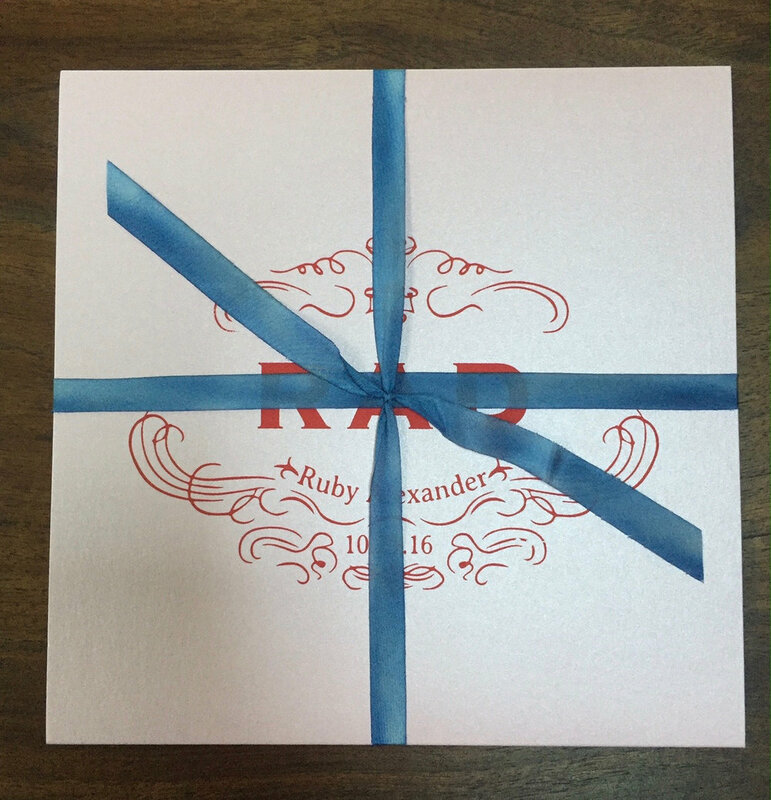 The metallic pink folding pocket piece we used for the main invitation looked like the pastry box with Ruby’s monogram instead of Mendl’s logo was tied with a hand-dyed silk ribbon in the perfect blue. When guests opened the “box”, the interior pieces were white with red and navy graphics. The response card was formatted like an international telegram. 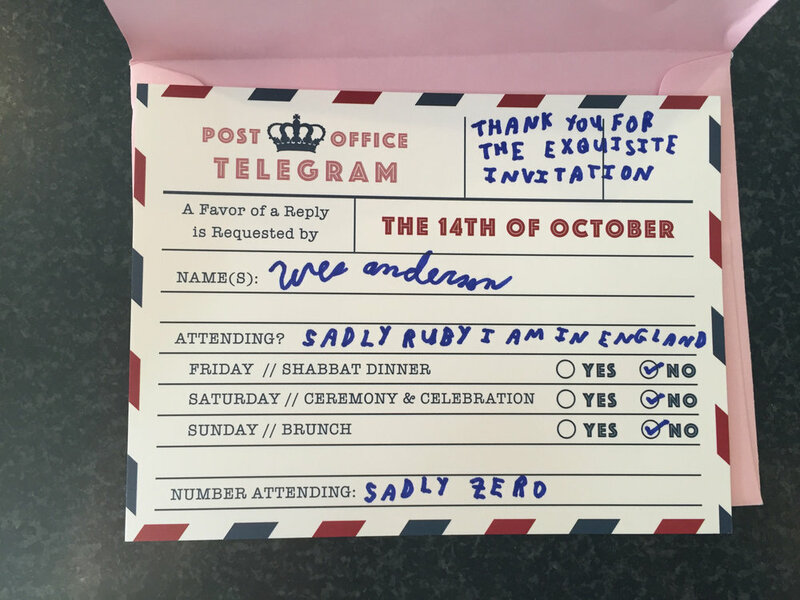 Wes Anderson was on the invite list, and when we got his response, we fell in love with his wording on the reply. Our favorite part: “sadly zero”. We still use that around the office every now and then. 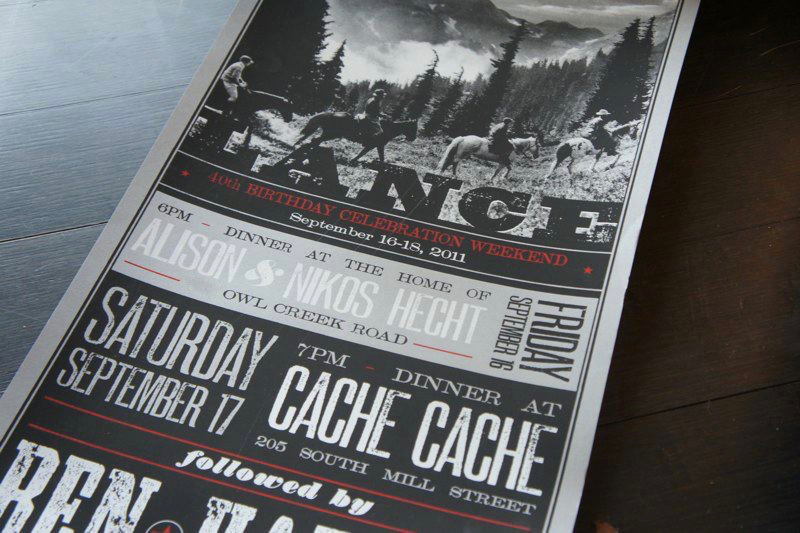 Renowned designer Katie Kime asked us to produce her husband’s 40th birthday. We knew that she wanted it to be creative to reflect her style. Katie and Greg have a beautiful home, as you can imagine, so we held the party there. 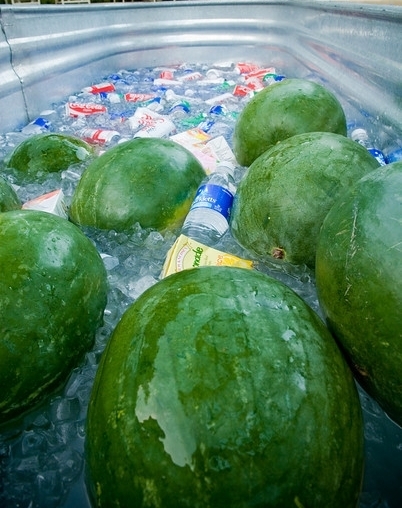 We used the outdoor area around the pool for the food and drinks. To make it fun and interactive, we created this Spice Bar for cocktails. We designed labels with Greg’s initials for spice tins that guests grabbed and filled with their own custom mix of spices to go on the rim of their cocktail. 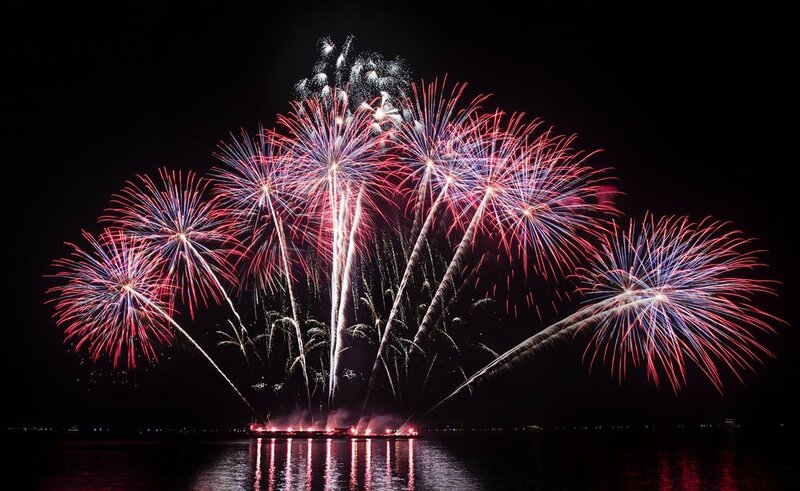 We were pleasantly surprised that both male and female guests loved the concept. Men are a little harder to get involved in an activity, but on this night we had them coming back to try to do a remix to make it perfect. 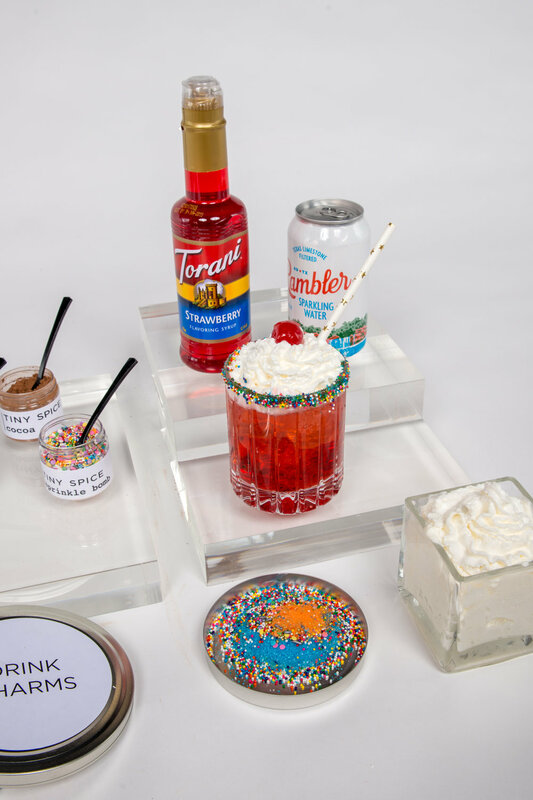 We've recreated the Spice Bar as a FUNBOX that you can order for your own event. It includes everything you need to create a similar activity for yourself. You just unbox it, set it up and HAVE FUN! 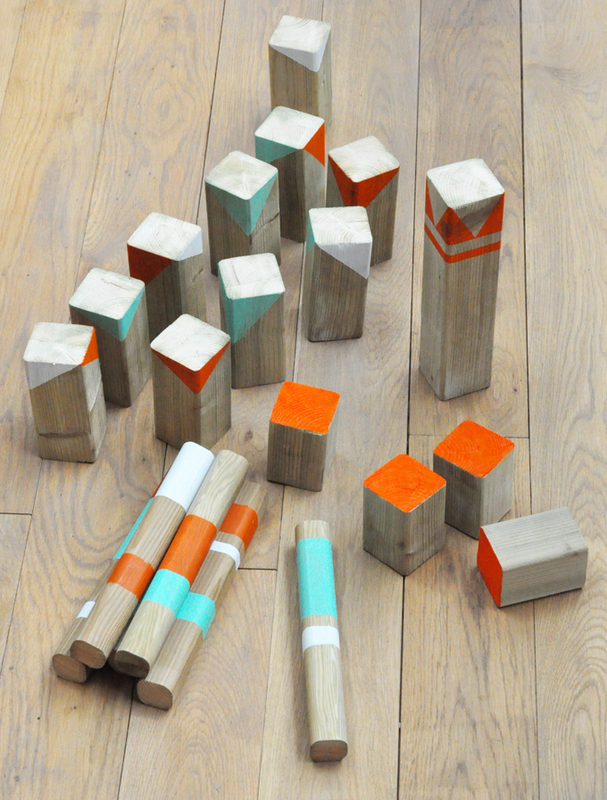 Check out SPICEBAR, along with our other FUNBOX products, here. We aren't florists by any means, but sometimes the situation arises when we need to create basic arrangements for an event. For instance, the annual dinner for Camp Wapiyapi is a fundraiser for an amazing summer camp for kids with cancer and their siblings. Needless to say, we do this pro bono and try to get creative in keeping the budget down so that as much of the proceeds as possible can go directly to the Wapiyapi families. For the dinner in 2013, we used our beautiful horn bowls and filled them with deep red rose petals. We also used our square wooden chargers to keep the look neutral: grays with pops of ruby red, and dark natural tones. We used lots of black votive holders to give us the glow of candlelight all the way down the long tables. We were really happy with the overall look and would recreate it whether budget was an issue or not. 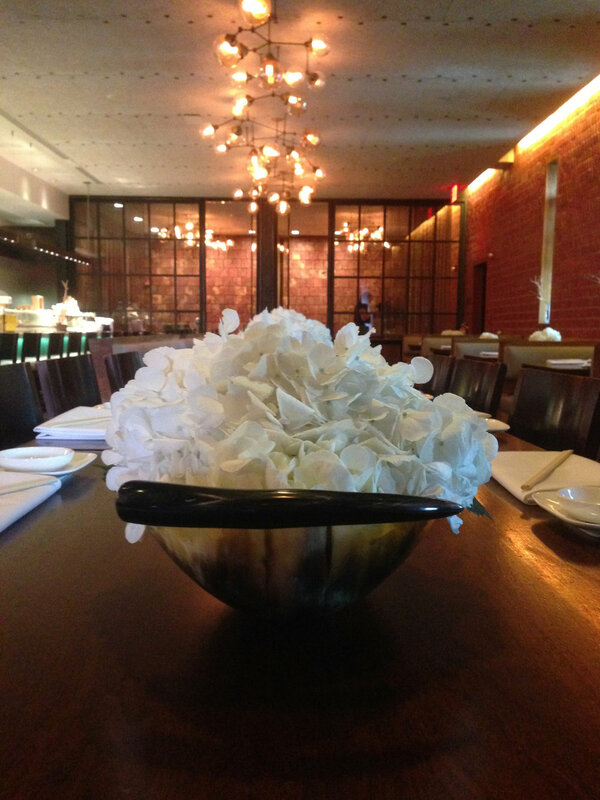 We've also used our horn bowls with billowing white hydrangeas, like we did at a Bar Mitzvah lunch at Chef Tyson Cole's award winning restaurant, Uchiko. 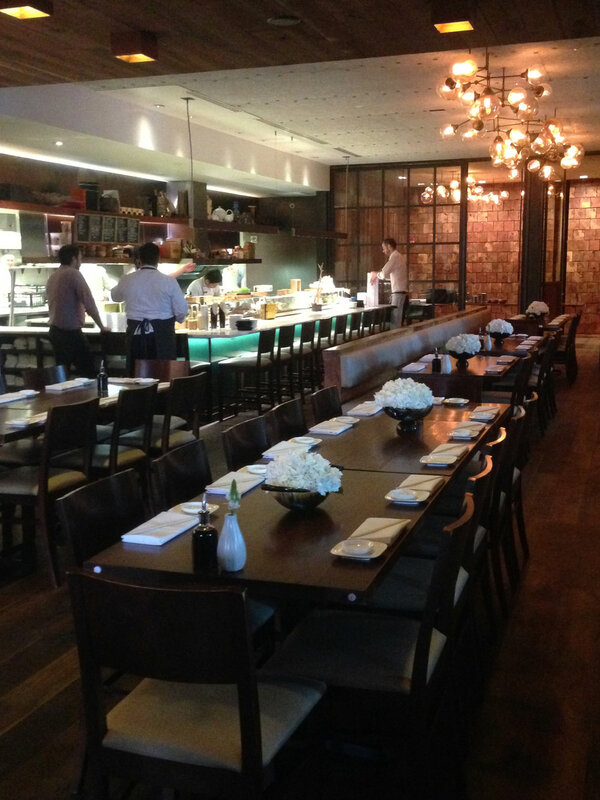 The restaurant has a gorgeous interior designed with a Japanese Farmhouse aesthetic, so we didn't need to add much to the tables to finish it out. Our horn bowls, along with the rest of our collection of modern, beautiful + unique rentals are available here! 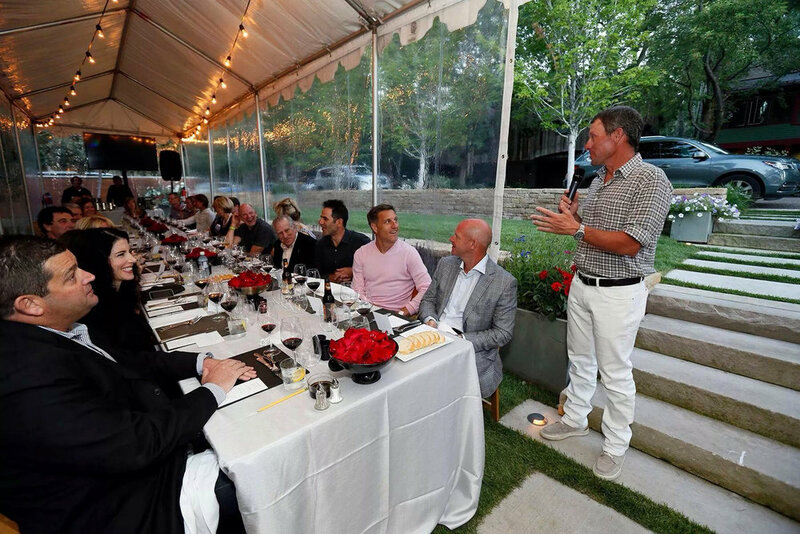 Lance Armstrong’s 40th celebration was in Aspen, Colorado. The printed pieces we created for this are some of my favorites. They needed to be as cool and fun as the weekend we had planned. For the save-the-date, we found retro album covers (from vinyl records) and used a ticket-shaped die cut to create these cool cards. The text details were screen printed over the album cover artwork in white. Since several tickets were cut from each album cover, no two save-the-dates were alike. The formal invitation was a screen printed poster inspired by Austin band posters rolled up into mailing tubes with matching address labels. The shades of grays, black and red that our incredible designer and screen printer, Dan Grissom, used were striking and set the mood for the unforgettable weekend ahead. 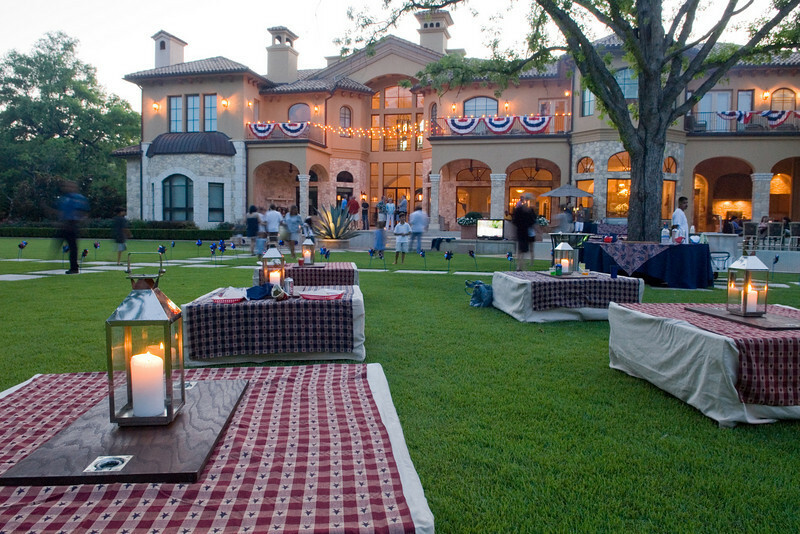 We partnered with Blackberry Farm on this fundraising dinner for Camp Wapiyapi. The table design we created for this dinner has remained one of my favorites over the years. I had the pleasure of brainstorming with the late Sam Beall on this event. Anyone who knew Sam or has visited Blackberry Farm, knows that he was a master of perfection in everything he touched. He came up with the idea of donating beer for the dinner and sending his master brewer, Roy Milner, to Aspen to walk us through a sampling of their best beers. 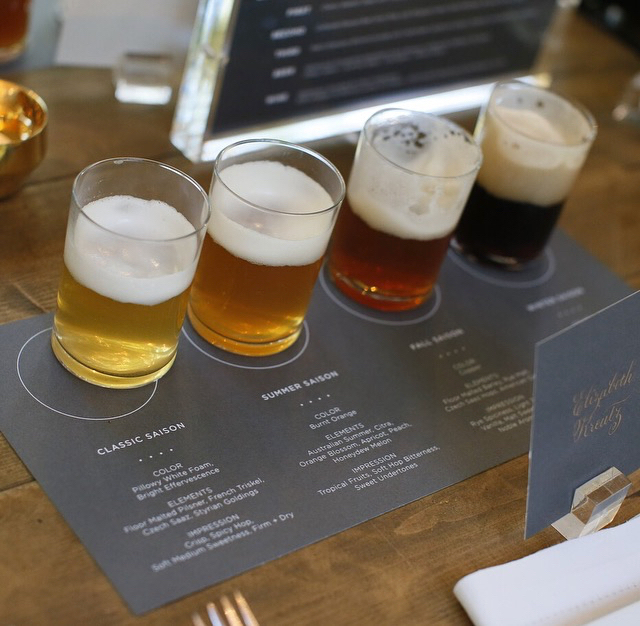 We designed a beer tasting place mat so that guests could follow along as Roy spoke about each beer. Our place cards were a dark gray with Copperplate calligraphy in metallic gold ink. 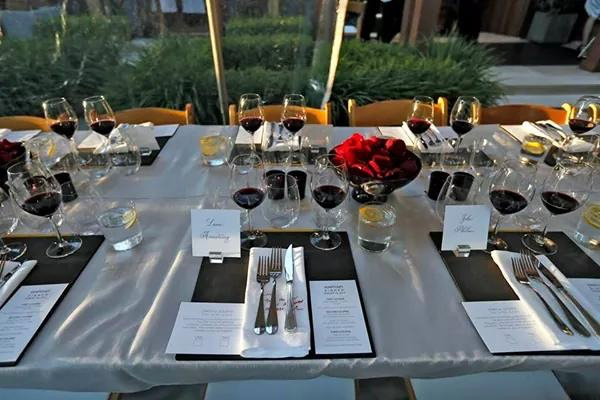 We used our acrylic place card holders, acrylic panoramic menu frames, brass votive holders and black opaque glass vases filled with multi-colored dahlias from a farm in Oregon.